Treat each customer in a personalized manner by tailoring the content, timing and volume to each customer’s particular circumstances. Make relevant and timely customer offers regarding financing, protecting their vehicles, and transitioning to a new car. 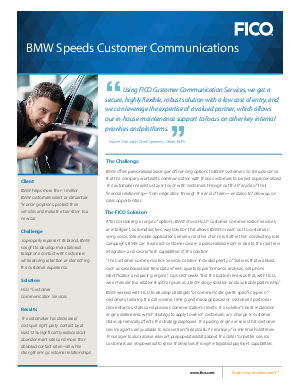 Improve engagement with customers who are late in their payments, while strengthening the relationship with those customers.Learn how they did it by reading this case study: BMW Speeds Customer Communications.